Being no stranger to playing the villain, Wang Maolei has put on a memorable performance once more to become the hated villain in Story of Yanxi Palace 延禧攻略. That's usually something that wins praise, yet there have been antis who are personally attacking Wang Maolei with comments as extreme as telling him and his whole family to die. While there are many that left supportive comments and called out the haters for being absurd, the actor admits that he's not so strong after all. 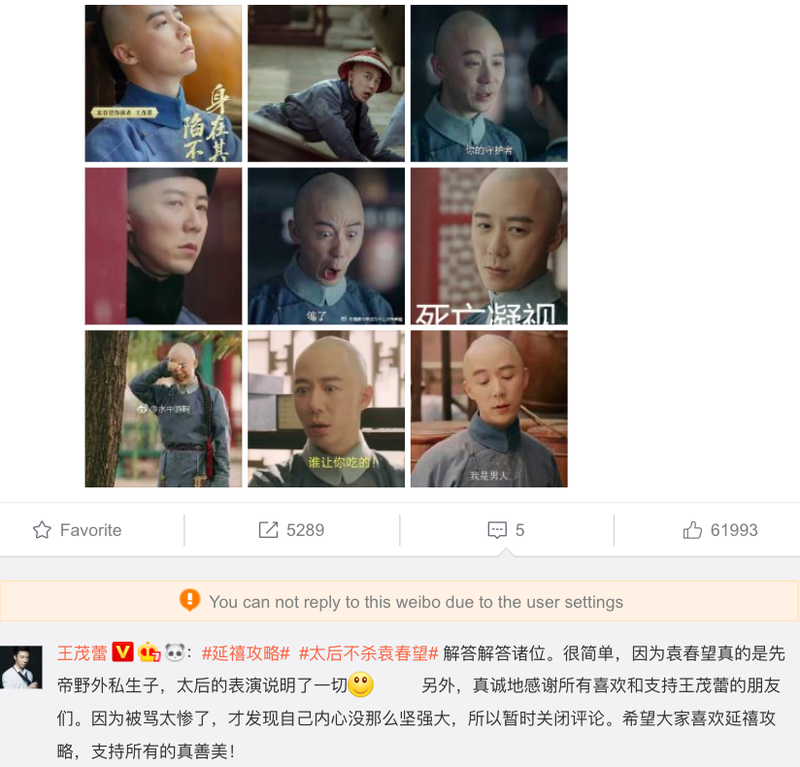 As he was being cursed at too much, he has decided to turn off the comments section on his weibo temporarily. He thanks everyone's support and those who liked Story of Yanxi Palace. Furthermore, he ends by doing a great service to fans and answering the question that has been on many people's minds after the finale. 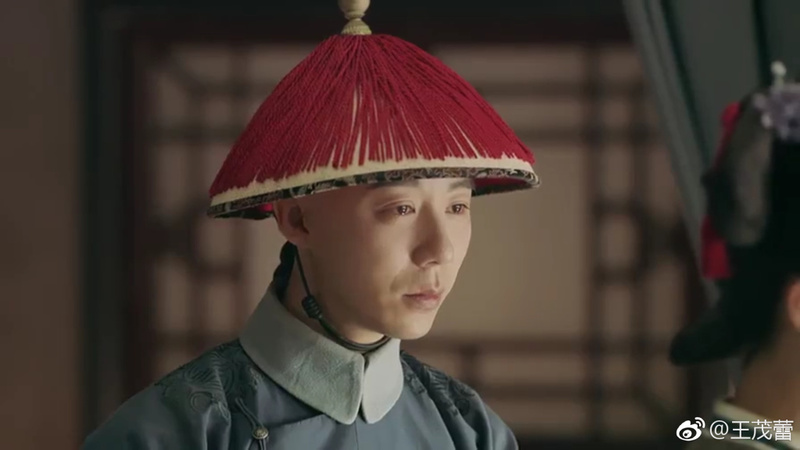 On his character's real identity, he confirms that yes, Yuan Chunwang is the illegitimate son of the late King. The Empress Dowager's reaction is proof of it. Being hated by people who watch your drama means you are an amazing actor. The People who have watch your drama feels the character you portray in the drama that is the successful act of an actor. People hated your character in the drama its not you. To Those People who hate the actor is nonsense hating him personally is crazy. The drama is not successful with out those talented villain actors. He is a great actor hate him all you can but it doesn't change the fact that he is very talented actor. The poor man. Some people are just so stupid. They don't realise he's an actor and just doing his job? And even bringing his family into it? Idiots! OMFG C-netizens are stupid and dumb! He is extremely amazing and super good at acting in this show. I loved how he met with Ying Luo and became friends or bro and sis, how he likes her and helped her. He was still great how he got angry with Ying Luo and betrayed her, everything he did was just so convincing! He's not those girly beautiful guys where you like them because of how cute of a baby they are. He's not handsome either. But, I did find this guy AMAZING! Reminds me of what happened with Rong Muo Muo although she's a kind old lady in real life. Well, at least he's becoming a legendary like her. Unreplaceable characters. Fans and Antis, can hate and love the artist with the same passion. Turning off his weibo is a good move. I think everyone in the show was really good at playing their roles but he was an especially great villain - my favorite out of all the baddies on the show. Yuan Chunwang was very exaggerated but i think it showed how twisted and vengeful he was. You always get the sense that he was up to no good, even when he was supposedly "helping" Ying lou. His crazed look amplified his hatred and made the ending so much more believable.